As the Sith secretly plot the Republic's downfall, Anakin's fall to the Dark Side begins. Episode II is probably the worst Star Wars movie ever made. It has terrible dialog, a terrible plot, terrible acting, and a confusing storyline. Can it be fixed? That is my intention, and while it can never be a great movie, I believe it is now very watchable. The romance between Anakin and Padme has been completely overhauled, so that their relationship becomes a strong and believable one. Anakin's relationship with Obi-Wan is also repaired. Additionally, almost all complicated and/or confusing elements of the plot have been eliminated. Dooku is the sole villain throughout, and there is no reveal to the Jedi or the audience about a Sith Lord controlling the senate. Finally, Jar-Jar screen time, as well as politics, have been stripped to the absolute minimum. Oh, and no Chosen One. L8wrtr - for his numerous encouraging comments and suggestions throughout, especially with the Obi-Wan/Jango scene; and, for providing the best way of handling the droid factory scene. wabid, emanswfan, Solid11 - my terrific work print team who provided many valuable suggestions, without which this edit would never be as polished as it is. The Phantom Editor - for providing the inspiration of how to keep the "kiss" in the movie. MP4 and AVCHD are 1080 HD. Generally speaking, I made A LOT of edits. The biggest editing choices involved a complete re-arrangement of the story's structure. I have moved what used to be a "reveal" scene at the end of the movie to the beginning, making it establish firmly for the audience who the bad guys are. Count Dooku now only has one name throughout the movie (gone is any mention of Lord Tyrannus), and throughout the movie it is now easy to pin mysterious/confusing plot elements to him. The red-herring of Sifo-Dyas is also gone, as all mention of him has been erased. The story now has two threads: first, Obi-Wan's quest to track down the bounty hunter; since we know Count Dooku is behind the assassination attempt, we can instead focus on the mystery slowly unfold before Obi-Wan's eyes. Second, the romance between Anakin and Padme. Instead of the creepy whiny obsessed stalker that Anakin originally portrayed, there is now no shred of evidence that Anakin has any hidden/prior feelings for Padme. Instead, there is a mutual attraction that naturally builds each step of the way. By the time the kiss happens, it should feel natural, and by re-scoring the scene (complete with extra birds chirping and rushing water) I have allowed the kiss to fade into what now can only be seen as the "morning after." What once might have been a creepy line ("Your presence soothes me") now is a gesture of true affection. * Obi-Wan on Geonosis transmits a message to Anakin in non-realtime which R2 is receiving in the ship on Tattoine. Beyond the major re-ordering of scenes, I have taken great care to trim dialog throughout to improve relationships (Obi-Wan and Anakin especially), remove bad humor, improve the likability of Anakin, and generally excise politics to the bare minimum. - Moved Dooku and Sidious scene to be the first scene with modified dialog, introducing Dooku by name and implying a plot to kill Padme. Dooku is now only Count Dooku; there is no mention of Lord Tyrannus. - Removed description of Count Dooku as "political idealist"
- Removed Jar-Jar antics when greeting Obi and Ani at the door. Jar-Jar now only has a single line in the entire movie, which is introducing the Jedi. - Removed Ani's "Grown more beautiful I mean" line, and Padme's lines about always thinking of Ani as a little boy. The exchange should now just feel like an awkward one, with equal amounts of flirting from both sides. - Removed Obi's "let's check the security" line and the shot of Anakin walking away. It's a redundant line given the next scene we hear that Obi has just checked the security. - Removed Ani's explanation why Padme covered the cameras (so he wouldn't be able to see her) and about Padme being "bait"
- Removed Ani wishing he could dream about Padme, and Obi's ensuing reaction about his oath to the Jedi Order and being mindful of his feelings. - Removed discussion of Ani's Jedi abilities; we now go from "I couldn't find a speeder I really liked" directly to "There he is!" - Removed Ani's dialog about wanting to catch the assassin; dialog is now Obi: "Where are you going? He went that way!" Ani:"This is a short cut, I think…"
- Removed insulting lines by Obi after "That was some shortcut Anakin." Now we go directly to Ani jumping out of the speeder and saying "If you'll excuse me"
- Shortened Ani's descent and landing on Zen's speeder, as well as his climbing up to finally use his light saber. - Removed Ani's lines "Easy" and the one about "Jedi Business"
- Cut short the packing scene after Padme says "Don't try to grow up too fast." All creepiness from Anakin in this scene is thus removed. - Removed Padme's line about her "Jedi protector"
- Removed the (dumb) end dialog between Obi and the Captain about who is going to cause more trouble. - Greatly shortened the Diner scene. No talking robot waitress, no discussions about droids, no talk about the cloners. The scene is stripped to the bare minimum in order to get the information that the dart is from Kamino. * Obi's line "Do you think a Jedi could have erased those files" becomes "Do you think Count Dooku could have erased those files"
* Removed discussion about Ani being too old to have been trained, as well as his feelings for Padme. Dialog now goes from Obi saying he is worried about his padawan being on his own to Mace responding that he must trust Ani will make the right decisions. - On Kamino, removed all mention of Sifo-Dyas and the clones being for the "Republic." Obi is now simply told to tell "The Jedi Council" that the army will be on time and it is a clone army. This removes a complete red-herring that can only confuse the audience. Instead, it is now left to conjecture as to who ordered the army, and concluding that Dooku did it is certainly a valid one. - Removed exchange about wanting to see the army and Obi saying "That's why I'm here"
- In the picnic scene, removed the beginning discussion about Padme's "dreamy" boyfriend and the bad flirting about liking politicians. The scene now starts with Anakin saying "I don't think the system works." - In the meadow scene, shortened Padme's long run to the fallen Ani, and shortened the rolling around on the ground and gazing at each other. - In the scene where Obi meets Jango, removed mention of Sifo-Dyas as well as Lord Tyrannus. The scene is now cut to be much more confrontational between the two, with much less dialog prior to Jango saying "Do you like your Army?" - When Obi reports back to Yoda/Mace, removed mention of Sifo-Dyas. - Removed Mace saying they should report to the Senate about their diminished powers, as well as Yoda's response. - In the Jango vs Obi fight, removed all shots of Boba in the ship, and removed his firing shots at Obi. Basically Boba is now a non-presence. - Removed final shot of Obi with his light saber as Jango flies away. - The balcony scene now ends during the kiss, with no break-away by Padme. This required rescoring so that the music doesn't abruptly stop. - Removed Anakin's final line after Padme says she'll go with him, apologizing. Due to these cuts, this scene was rescored as well, to ensure the star wars theme music played fully. 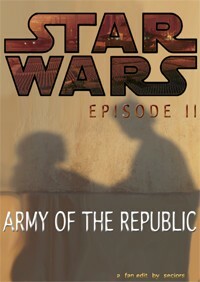 - Trimmed initial discussion between Watto and Ani to jump right to Ani asking about Shmi. - Removed Watto asking Ani to help him out since he is a Jedi. - Removed Watto saying he can't believe he freed her and married her. He now just says he married her. - In Jango/Obi astroid field fight, removed all lines by Boba except his first one ("Dad, look!"). Also removed Jango saying he just doesn't give up. - Shortened the astroid field fight. - Obi now releases the canisters on his own accord instead of asking R4 to prepare and then do it. - Removed Obi's flyby of Federation ships (and mention of them to R4). They just don't look like ships and so it seemed like a strange statement. - Removed scene where Ani returns to the homestead with his mother on the bike. - In the funeral scene, removed the two other graves; while we can guess that one is Lars' prior wife, it is a mystery never explained, and there is no need for them. - Removed Lars' opening eulogy. Now only Anakin speaks. - Removed Ani's "so much" after saying "I miss you"
- Removed R2D2's arrival and ensuing dialog. Scene ends after Anakin says "I miss you." - In the garage scene, removed Ani's lines "Why'd she have to die" and "I know I could have saved her!" - On geonosis, removed the dialog between the Viceroy and Dooku. The subplot that the Viceroy wants to have Padme killed is no longer. Instead, Dooku was behind the assassination attempt (which we learned in the opening scene). It was strange that the Viceroy waited 10 years to finally want her assassinated anyway. - When Obi reports back to the Council, removed his beginning discussion with R4 (or to himself?) about his antenna problems and wondering why Ani went to Tattoine. - Obi only mentions the "Federation" and no other group pledging their armies to Dooku. - Back at the Council, removed dialog/debate about whether to create an army. The scene now starts with "This is a crisis." - Removed mention or need for a Senator to propose the extra powers for the Chancellor, and "If only senator amidala were here…"
- Removed Jar-Jar speaking to the Senate. - Removed the first part of Palpatine's speech about loving democracy. - Removed the droids leaving the ship, and all of their future appearances until the marriage scene. - In the droid factory, Anakin now uses the force to save Padme. * Jango does not die. The attack by the Reek on Obi/Mace is cut. Thus we never see Jango and Boba again after Jango sprays fire at Mace. - Removed scene where Ani instructs the pilot where to shoot the structure and Obi's "Good call my padawan"
- Shortened second "war room" scene, removing the Geonosis leader's dialog as well as some of Dooku's. - Changed Dooku's final line to be "I must take the plans to my master"
- When Padme falls from the ship, greatly trimmed the dialog between Ani and Obi to make Ani less whiny. No talk about being expelled from the Jedi Order and "I don't care!" - When Padme wakes up, trimmed the dialog so that she doesn't say we need to get to that hangar (how would she know that they are going to a hangar?). Also removed the awkward running in the sand. - When Obi and Ani confront Dooku, removed Anakin's line about paying for all the Jedi Dooku killed. - When Dooku fights Yoda, removed all of Yoda's grunting noises. - Changed Yoda's final line to remove the word "clone." Now he says "Begun the war has." I dislike calling it the "clone war" as it seems like a blatant pitch for the clone war franchise. Okay so finally reviewing this after watching it last christmas. Great job, I mentioned in my "Return of the Sith" review that I narrowed down my Star wars downloads to this and L8wrtr. Both seemed to be proper re-edits of the new trilogy (although I'm hoping Seciors is finishing the final movie in his trilogy as I'm typing this). So, as a former Star Wars fan (and now Re-newed) I decided that barring a disaster with the 3rd movie, Seciors has made my Preferred edits of Star wars 1, 2, and 3 . Watching these re-edits makes me realize that George Lucas did put his heart into the movies while filming, but also, that he didn't have enough people around him willing to tell him that he was going too far in certain directions etc.. Well, thankfully these problems seem to be fixable with a lot more editing than he was willing to do himself, and which he probably should have done initially in the actual screenplays themselves. His new trilogy really reminds me now of Peter Jackson's current Hobbit series, where they seem to be more animated because of the special effects tools available nowadays, making them more childish than the original trilogy's, but there's more room for visual imagination with the world and the creatures, which both bad and good. Back to the subject of the movie, Attack of the Clones was my favorite of Star Wars 1, 2, and 3, Phantom menace was nearly unwatchable to me, and the third one has a spectacular Finale, but is just waaaayyyy too much mayhem and nonsense leading up to it. The removal of moments of Anakin being a creeper is a mostly a good thing although they are good warnings of his descent into evil in the third piece. Pacing-wise, the movie goes by very quickly, as I stated this was my favorite of the three so I remember enjoying it in the theater as much as I did because it took it's time and gave me a sort of "vacation" in Star wars universe once again as the originals had done. Otherwise fantastic edit , my Preferred edition . Thanks for the review! Very flattering that my versions are your preferred ones. Yes, I *will* get to Episode III! I am really hoping I can get it done sometime this year. Having thoroughly enjoyed Seciors Return of the Sith Revisited Edition, I thought I'd go on with his second. I was very encouraged by some of the reviews here that say that the love story is handled particularly well and that was a feature of RotS:RE. Again, a short run time of 85 mins - can it be achieved? A BIG YES! I got something I wasn't quite expecting from Army of the Republic - to me, this film now feels like a sci-fi, wrapped around a love story. The editing of Ani/Padme is done so well...that it no longer feels uncomfortable and awkward. There are some cringe scenes that are left in, but because they are handled well it reinforces the love story! I did note a couple times where it seemed that the transition occurred quickly to cut off some dialogue that Seciors clearly didn't want - but it's nothing jarring. There are a couple scenes that I also still in- the younglings and that cafe scene, which others did away with by simply having the assassin say Kamino. Anyway, again - really enjoyed it, I think Return of the Sith is more fun to be honest..I'm hopiing Seciors may have a stab at Episode 3. In my mind, there were two major problems with AotC – the dire love story and the confused Machiavellian plotting of the Sith. This edit successfully resolves both of these issues. A number of romance scenes that I always hated (me and most editors!) are retained, but by removing the worst of the dialogue, no longer do I think those scenes are beyond saving. Instead, some clever editing (including the insertion of the under-rated deleted scenes with Padme’s family) has improved the love story tenfold. 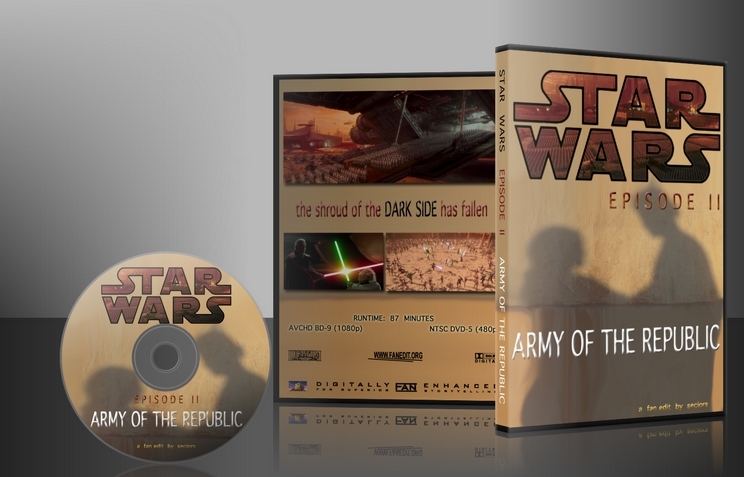 The editing of the Clone army story is simple, but extremely effective. The ridiculous Sifo-Dyas plot point is removed. In this edit, it is clear that Count Dooku is the ex-Jedi behind the secret development of the Clone army. Also, the revised first scene establishes Dooku as the villain of the movie (in league with a mysterious master dark lord). The movie benefits greatly from this improved clarity of storytelling, whilst successfully retaining the mystery of the exact identity of Darth Sidious (thereby increasing the impact of his reveal in Episode III). There is some very clever dialogue replacement - something I have never considered for this movie, but it is done with skill and works extremely well. Technically, you get no complaints from me. The sound is crystal clear and I’m always blown away by how beautiful these movies look in HD. The transitions (audio and video) can sometimes be a little abrupt, but I understand this just comes with the territory when editing a Star Wars movie. All-in-all, another success from one of my favourite fan editors. Well done, Seciors! Watched this two days ago, and I have to say, waiting a long time for this to come out...it's a shame to say that I'm feeling a tad mixed. Let me start with what I really liked about the edit: the love story. The scenes were arranged very well, and you managed to get across the idea of Anikan and Padme having a "morning after" scene better than L8twrtr, and given how great The Republic Divided is, that's saying something. The only thing about it that bugged me was placing the funeral scene before the garage scene, because we see Padme in her white dress, then her blue dress, and the next time we see her in her white dress again, and it's something I can't get past. Also, if you ever think of making a version 2, I recommend watching Slumberland's episode 2 edit and how he makes the lake kiss look like it's taking place at sunset, as that would help with the "morning after" vibe I think you were going for. Also, loved how you removed "we've got to get to that hanger," really worked out well. For Obi-Wan's story, I really don't abject to the diner scene, as I'm a fan of the 1950s vibe, and I can somewhat get behind keeping the Yoda/younglings scene as it comes off less as Obi-Wan being clueless and more about him confirming his suspicions. The Jango/Obi-Wan conversation is also welll done, being able to remove any mentions of Tyrannus and Sifo-Diyas. However, I really felt that the first fight they have should've been cut down like how the Phantom Editor and L8twrtr did. That way when we get to the space battle it doesn't feel like the movie's dragging, which I honestly thought it was sadly. Now some stuff I really didn't like. I hated how much of a novice Anikan came across as in the movie. He loses his lightsaber, misses his turn while in the car, and then get's his lightsaber smashed. If he's so attuned to the force that he can levitate a ball and free Padme, he should've at least seen the lightsaber stuff coming. The Anikan/Palpatine scene was also really missed, as it plays nicely into episode 3. And finally, cutting out the Obi-Wan/Dooku. I know how it kinda makes the Jedi look stupid for not taking Dooku's word, but let's be honest, they had it coming. They wouldn't believe that Dooku would take a hit out on Padme, I can believe that they don't pay his warnings lip service. It's just that that scene shows Christopher Lee at his finest, and removing that scene, imo, nullifies any attempt to try an put focus on Dooku, because I really enjoyed you're restructured opening. Also, I'm not sure if it was the choices you made with this edit or because I really like L8's take, but I didn't enjoy Yoda's lightsaber duel as much as I did. I'm sorry if I seem negative, when there were some things in this edit that I really loved and should be incorporated into other edits and I do recommend it, but some there was too much that rubbed me the wrong way. "So here we go again, another ATOC edit," you may be thinking. But, no, this is most certainly an amazing version of the film, with a new spin. I was pleasently surprised to find that I did not just find the film not annoying or weak, I found it enjoyable and strong.